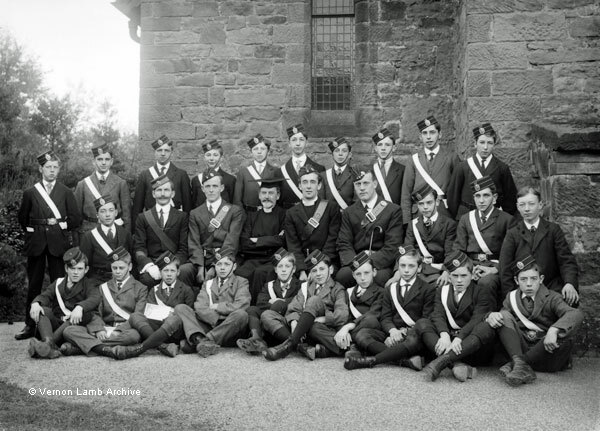 Description/Historical Information: Matlock Church Lads' Brigade, Company 3126, which was founded in 1914 (enrolled 11th March), seated outside All Saints' Church. The vicar in the centre is the Rev. J. B. Hyde, Chaplain of the Company, who founded the Matlock Bank group. To his left are 2nd Lieut. Foulds and Staff Sgt. F. A. Durrant. On Rev. Hyde's right are 2nd Lieut. A. N. Hare (curate of All Saints') and Capt W. H. Worthington. E. B. Foulds, of Smedley Street West, Matlock Bank dealt with the correspondence [also see VLA4985, VLA4991, and VLA5223].